It’s a-ok for nerds like us to build our own hardware and have this capability, but I’m worried about it becoming commercially available. We already have a huge enough problem with texters running over people. Try the Nokia N95 with Joikuspot. It creates a WLAN access point with your nokia n95’s 3.5G(3.5 in australia, not sure what you guys have in america). I use it with an unlimited dataplan and get a solid 7.2mbps connection through most of my state. This means that all of us in the car (we’re a techie family, so everyone of us has a laptop) can use the internet through the WLAN AP. Just thought I’d give you all that heads up, in case you wanted to go the software route out. They’re expensive, but extremely hackable, as they run embedded Linux. 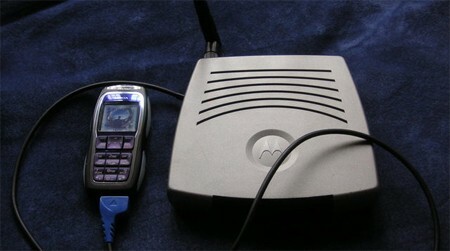 I’ve got a wgt634u with a prepaid razr jacked into it sitting in my office at home that’s my new vacation internet access. I’ve tossed around the idea of hooking it up in car but have to sort out the power supply first. The whole setup so far has been pretty cheap – around $75 IIRC for the phone & router (both used off ebay) and a 1ft mini-usb cable. It’s setup to dial on demand, so all I really have to do is plug it in and connect to the wireless, and I’m off. IIRC, my TyTN (ATT 8525) can do this out of the box, without any extra hardware. Sure the EDGE data is kinda slow, but I’m probably not going to do any better in my area (southern MD) anyway.